Retired Gen. William Westmoreland, who commanded U.S. forces during the Vietnam War from 1964 to 1968 and advocated a strong military buildup at a time when American casualties were mounting, has died. Westmoreland died Monday of natural causes at Bishop Gadsden retirement home, where he had lived with his wife, said his son, James Ripley Westmoreland. He was 91. "I have no apologies, no regrets. I gave my very best efforts," Westmoreland told The Associated Press in 1985. "I've been hung in effigy. I've been spat upon. You just have to let those things bounce off." he gave it everything he had (audio)," said CBS News Correspondent Dan Rather, who covered the Vietnam War. The silver-haired, jut-jawed officer, who rose through the ranks quickly during World War II and later became superintendent of the U.S. Military Academy at West Point, N.Y., contended the United States did not lose the conflict in Southeast Asia. "We held the line. We stopped the falling of the dominoes," he said in 1985 at the 20th anniversary of the Army's 173rd Airborne Brigade's assignment to Vietnam. "It's not that we lost the war militarily. The fact is, we as a nation did not make good our commitment to the South Vietnamese." "He maintained it wasn't the U.S. military that lost it, it was the U.S. political leadership, diplomacy and the world strategic view, which he did not command," said Rather. As commander of U.S. forces in Vietnam, Westmoreland oversaw the introduction of ground troops in South Vietnam and a dramatic increase in the number of U.S. troops there. He also sought in vain permission to engage enemy forces in their sanctuaries in Cambodia, Laos and North Vietnam. American support for the war suffered a tremendous blow near the end of Westmoreland's tenure when enemy forces attacked several cities and towns throughout South Vietnam in what is known as the Tet Offensive in 1968. Though Westmoreland fought off the attacks, the American public remained stunned that the enemy had gained access to the U.S. Embassy in Saigon, even if only for a few hours. After the event, President Lyndon Johnson limited further increases in troops; Westmoreland was recalled to Washington to serve as the U.S. Army Chief of Staff after asking for reinforcements in response to the attacks. Later, after many of the wounds caused by the divisive conflict began to heal, Westmoreland led thousands of his comrades in the November 1982 veterans march in Washington to dedicate the Vietnam War Memorial. After his four-year tour in Vietnam, Westmoreland was promoted to Army chief of staff from 1968 to 1972. He retired from active duty in 1972 but continued to lecture and participate in veterans' activities. "I met him a couple of times," former South Vietnamese Maj. Gen. Nguyen Huu Hanh, who witnessed the fall of Saigon, said Tuesday. "He was a good man." William Childs Westmoreland was born near Spartanburg, South Carolina, on March 26, 1914, into a banking and textile family. He attended The Citadel for a year before transferring to West Point. He graduated in 1936 and, during his senior year, held the highest command position in the cadet corps. He was promoted to brigadier general during the Korean War and later served in the Pentagon under Army Chief of Staff Maxwell Taylor. 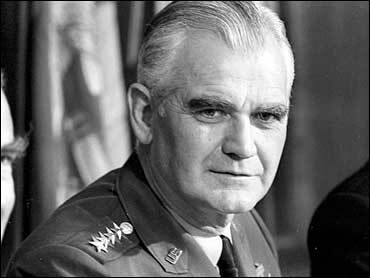 Westmoreland became the superintendent of West Point in 1960 and, by 1964, was a three-star general commanding American troops in Vietnam. The decision to put him in a command in Vietnam may have been a result of the awareness by President Johnson that it would be a television war, says Rather, and LBJ wanted someone who looked the part. "General Westmoreland was every inch a soldier, every inch an American soldier," recalls Rather. He was "ramrod straight, looked you in the eye constantly, spoke in sharp, direct sentences." In later years, Westmoreland often spoke to Vietnam veterans' groups, accepting invitations to visit veterans' groups in all 50 states, his son said. In addition to his son, Westmoreland's survivors include his wife, Katherine, and two daughters, Katherine and Margaret.